Before any of you think I have totally gone off the deep end, I just wanted you to know that I have simply been going through one of my identity crises. As you can see, poetry and music are really my only ways of communicating and participating in life during these times. These are not sorrowful, depressing times for me. These are days full of exploration and self examination. I truly honor and cherish these times (despite the fact that I spend the whole time apologizing to everyone for my "strange" mood). But I find I can not write in prose, try as I might. My sentences instead appear as long lines of poetic verse. The thing is, when I "come back out" I am a different person in many ways. I feel I have traveled through my inner subconscious and revisited areas which have long been untouched and untapped. For example, my poem on "Americans are..." is long, long, long overdue and through a conversation with Alice about the way people talk about other cultures in sweeping generalizations (thank you Alice) it triggered my feelings inside which I had never really let myself feel. Letting myself experience my anger about things that have upset me and then actually writing about it through poetry is a release for me like no other! The same with my feelings of inadequacy, guilt and insignificance. I yell them out to you, to the world, to myself and thereby become just a little more free. Is it not ironic that through sharing my embarrassing insecurities, I end up with a feeling of courage and self-assurance? I am no longer trying to be someone I am not, hiding my weaknesses in the hopes that no one will see. As I recently told someone (who surprisingly became very dear to me during this time yet we have never met), the last time I went through a major identity crisis the BBFN newsletter (which ultimately turned into the Multilingual Living Magazine) was born. I am never sure what will come out of my inner turmoil (if anything) but I am now fully confident that it belong to my life and that these are precious times to be cherished and protected. The downside from these times is that my friends and even new acquaintances (my poem titled Friendships With Gods) are the unfortunate victims of my pouring out of whatever is on my mind! And I end up feeling so inadequate, so small, when I compare myself to them. They appear as a gods before me and I a helpless mortal, always making mistakes and needing their guidance and support. Like in Greek myth, when a mortal going about his or her business happens to cross paths with another being. The mortal thinks the other is also fellow mortal but ultimately the latter ends up being a god or goddess, there for a specific purpose - the only give away is a slight scent in the air, a fluttering of wings, the glint of gold. Other times their godliness appears boldly and confrontational. During this time, I was extremely lucky that I had people with which to reach out and pour out my heart and who didn't judge me. Some I know were with me each step of the way (even if they were a little worried) while others I hope I did not frighten off completely to be lost to me forever. I mean, if you haven't even met me and I share my life story and then go on and on from there, I will understand if you never want to communicate with me again! During these times I simply crave a deeper, more intellectual conversation and end up scaring most people away. Someone I now hold close to my heart through all of this (although I know nothing more about him other than what he has shared via his soothing words on CD and via his books which I clasped tightly in my hand each day as I rode the bus to and from work) is the poet David Whyte. This man is a genius and has truly changed me completely, inside and out, simply through his words. He gave me the permission to let go, to fall, to dangle and breathe. His descriptions of soul-searching and poetry on his CDs are beyond comparison! I have been YEARNING for the sustenance of such words and fed off them daily, just sobbing from the release they brought me. And my brother, Thomas, uploaded one of my favorite songs of his titled "The Whole World" just in time – today! I listened to it literally ALL DAY at work, over and over again, and it brought be through this final day of unrelenting soul-searching. It is a song about war and right now we need as many anti-war songs as we can muster! But his song makes you want to jump up and dance, it makes you believe that things will be ok, that our sorrows and frustrations right now really are temporary because we are going to solve this somehow. Wars, no matter where they are in the world, sap our energies no matter where we live. But for those of us in the US right now who are against everything about this war and administration, we need your compassion and your support. Our shame and frustration for what is going on here is a heavy burden to carry. I think what has happened in the past year is that I have been racing along this path which keeps opening up before me, one step after another - totally magical! I have no idea where it is leading me much of the time but it beacons me and I know it is a good path - my heart is in the right place. But on March 2nd, after the most current issue of Multilingual Living Magazine was completed, I simply collapsed emotionally. Had it not been for the kind words of some very special people, I think I would have just thrown in the towel on the magazine completely. My husband listened to me sobbing at the dining room table days later saying, "I give up, I give up." I mean, after a year of extremely difficult and satisfying work by both Alice and I, the magazine is barely breaking even financially! And it isn't even in print! I can't do it all, Alice can't do it all and we aren't sure what the next steps are either. And, as life would have it, neither of us know anything about marketing, so we get by but funding is primarily through subscribers and a few supportive sponsors/advertisers (most we let advertise in exchange for services or support since they can't afford cash). Luckily, Alice is a strong soul and won't let me give it all up simply because I am having an identity crisis (thank you Alice, AGAIN). Nor will my family - thank you Mom for offering to help! Nor will many of you out there who took the time to offer support and encouragement and the reasons why I do this. I am in awe of the dedication and support all of you provide despite the fact that you receive absolutely NO pay. A volunteer's job must be the most difficult yet the purest form of giving around! So, you few readers of my blog out there... the truth is I don't know WHAT to do but one thing I do know... I am not going to pretend that I do know and I am not going to put on a staunch, serious Editor-In-Chief face in the hopes that you will think that I do. And now I know that I don't have to. In fact, I know that I simply can't pretend I am someone that I am not (at least for not very long) without it slowly wearing away at my psyche. But on March 2nd, I didn't know I was doing this and I came face to face with the fact that I was scared to death that if I let down my guard, you would think less of me and that I would do the whole magazine, the whole BBFN group, a disservice. I thought that everything I had worked so hard to create would collapse. I must have believed that it was still standing precariously on the image that I had created in my mind a year ago. I had clearly failed to see that it is has really, truly moved on - it is now standing on a solid foundation of its own with dedicated contributors and subscribers who don't care if their Editor-In-Chief is having a identity crisis or not! You are the foundation upon which this all stands and you are steadfast. The truth is, I am simply a crazy, neo-hippy who tries to live as honestly and true to humanity and the earth as possible. I am a kind person, I am not a greedy person, I am not competitive and I live my life through intuition and a true search for a higher consciousness. I adore the powers of humorous, intellectual wit, the kind which makes you delight in the fabulously unique constructs of images and use of words! The spoken and written word absolutely captivate me. You won't find me in a fancy suit (at least not willingly), I don't wear lipstick (or any makeup at all) and I am fiercely devoted to my husband and children. My plan was to become a Mediterranean Archaeologist out in the dirt each day, evenings with her head in some book or listening to the movements of the tide, but instead I ended up here and although I sometimes wonder what "here" really is, I wouldn't change it for the world. 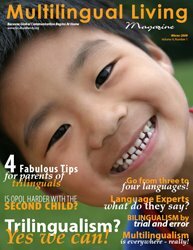 I do Multilingual Living Magazine because I have to do it. The time has come, the world is ripe and we must take this opportunity to help to continue making a place for multilingualism and multiculturalism in the consciousness of this world before it is too late and the opportunity wavers. We need to show the world how absolutely beautiful and magical and emotional multilingualism and multiculturalism are! I am not a graphic designer, I am not a website designer. I simply learn what I have to learn to make this magazine happen and Alice and I create this for us, for you, for everyone, for the world. I can not explain why I do this other than that. And please know that when it comes to Multilingual Living Magazine, Alice and I are both very professional and expect professionalism on all levels from start to finish. This is one aspect of what often feels like a dual world but is really all about balance between the wild and crazy and the serious and stable. We take the process very seriously. We feel that we have a duty to ourselves, our contributors and, of course, our readers. We take great pride in this. This is why I am so frustrated when I make mistakes! You are paying for quality and we aim to deliver! So, in the end, I am still here and whole and alive... in fact, I am certain that I am more alive than before. And from all of this, there is one thing I will try to never forget (and all of you writers out there, don't let yourselves forget this either): writers simply NEED to write, I need to write. It doesn't matter if no one is listening, if no one is reading, if no one is seeing what I (we) produce. No matter what, we need to keep creating. All of the glorious words and creative thoughts out there written and created by others cannot satisfy our own needs to write and speak our own words. We each have our ways of bringing forth great creativity and abundance from within ourselves. We must never, ever forget how important it is for us all to tap into that which feeds and waters our soul. Life is simply too short to let it pass unattended.